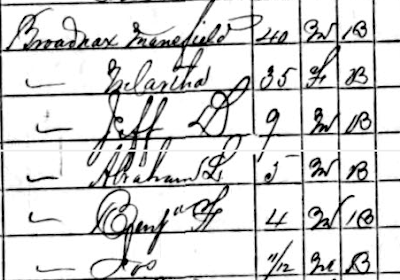 I have found ten black/biracial families with sons named Abe Lincoln and Jeff Davis in the 1870 and 1880 census records. 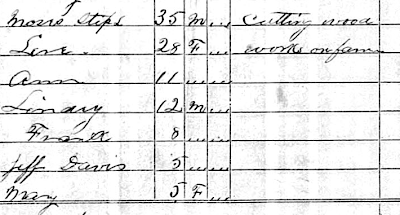 All of them lived in the ex-Confederate South. 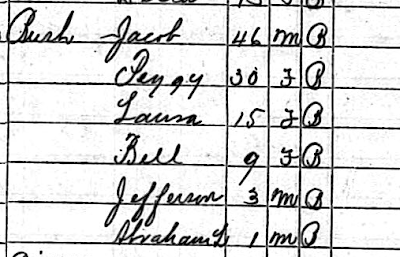 In most cases, the children were born after 1865, suggesting that parents, rather than slaveowners, may have chosen these names. In those cases where one of the brothers was born during the war, it is always Jeff, not Abe. This pattern does not seem to be peculiar to any particular state, but it does seem to be limited to newly freed slaves in the ex-Confederate South. I am a firm believer in the proposition that names convey meaning, but I'm not sure what the message is here. Is this a case of two names that "go together" because of ubiquitous pairings in news items and popular songs? I remember once reading a WPA slave narrative (admittedly, not the very best source) in which an elderly ex-slave characterized Lincoln and Davis as partners in bringing about the war that brought on freedom. He didn't distinguish between their motives — he argued that their quarrel created the necessary conditions for emancipation. If that was a wide-spread idea, it might account for the Abe-Jeff pairs.